“This square will do what we’ve struggled to do over the years, develop a citywide spirit” -Mayor Hazel McCallionThe city of Mississauga, Ontario is one of Canada's most diverse and quickly growing cities. Debt-free since 1978, Mississauga also has one of the longest-serving and most popular mayors in the country. Yet despite this diversity and stability, the city has continued to struggle to cultivate a sense of place that would bring people downtown. And that's part of what makes yesterdays' grand opening of Celebration Square so exciting: the Square is the first step in creating a great destination that shows off the best of Mississauga and draws residents to enjoy their city center. 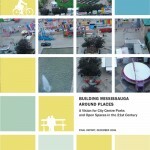 Missisauga's Celebration Square is part of what we see as a wonderful trend toward the the Re-Emergence of the Public Square. Instead of turning to big infrastructure investments to catalyze new life downtown, cities are turning to public squares and plazas with strong programming to stimulate investment. From the intense involvement of more than 1500 Mississauga citizens in several rounds of community workshops and visioning sessions, it was clear everyone wanted their new Square to become the heart of the city- a place full of events that give people a reason to come enjoy their downtown. Just months after the initial workshops, citizens and local organizations came together to undertake a series of experiments and short-term actions (that we now call “Lighter, Quicker Cheaper” strategies) to implement many of the ideas that the community came up with. They created an ambitious summer schedule of programs and events that ranged from Farmers markets to Vintage Car Club Thursdays- and put public seating and tables out in the square right away. That vision has really translated into the Square’s current programming: check out this calendar of amazing events coming up this summer in Celebration Square. The Mississauga City Council has even started to hold its meetings in the square! And there are big plans for Canada Day 2011: this year’s festivities in Celebration Square include performances by These Kids Wear Crowns, pop artist Fefe Dobson and the chart-topping Shawn Desman. The square will also feature fireworks, an aerial cirque show and and unique art, dance and music fusion performances in the amphitheater. 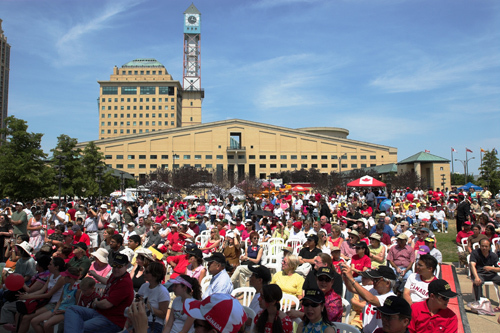 ‍Right after the initial visioning process, Mississauga tested lighter, quicker, cheaper programming like this Canada Day celebration to inform the current design. The plans for Celebration Square were just one part of a comprehensive City of the Future Campaign, where we led training sessions for city staff, a Power of 10 plan for the whole city and a detailed concept plan for the city center. Many of the ideas that emerged from these processes are reflected in Mississauga’s comprehensive Downtown 21 Plan. "The excitement [PPS] helped create in the community resulted in the Federal and Provincial governments partnering with us to invest $43 million in the complete reconstruction of the Square... It is spectacular. Don't worry we have taken your advice and have also invested substantial dollars into the programming of Celebration Square. As you recommended it is being operated as an outdoor community centre. I am totally amazed at how the seeds (and petunias) we planted, with your help, just a few years ago have grown into what in just a few short years will be something that will be cherished and enjoyed for generations to come. Have you visited the new Celebration Square? Tell us what you think in the comments below!